A taste of Sweden on your dinner table. Photo by Paul Brissman. Salmon with dill is the Swedish equivalent to American meat loaf. Growing up in Sweden, it was a weeknight dish that every family had almost every week. I love the simplicity of the dish, although I kick up the heat a few notches with dashes of chile powder. 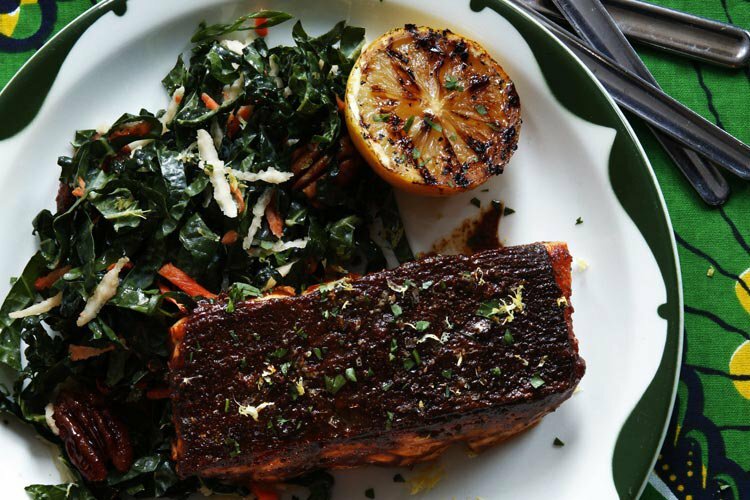 I love to pair this salmon with raw kale salad. The mix of kale and root vegetables makes a salad that’s not only healthy, but restaurant-level impressive. This cooking technique will give you salmon that’s creamy, almost custardy. If you prefer it more well done, leave it in the skillet for a few more minutes. 1. In a mini food processor, blend mustard, dill, garlic, chile powder, coriander, cumin, two tablespoons of olive oil, two tablespoons of lemon juice, and 1/4 teaspoon pepper into a paste. Transfer the paste to a bowl. 2. Season salmon fillets with salt and pepper. 3. Heat the remaining two tablespoons of olive oil in a large skillet over medium-high heat. When it shimmers, add the salmon fillets, skin side down, and brush half of the paste on the fillets. Cook for four minutes, then add butter. Continue to cook, spooning the oil and butter over the salmon, for two minutes. You'll see the color changing as the salmon cooks from the bottom. Flip the salmon and brush the remaining paste onto the other side. You want the heat to kiss the salmon on this side, so take it out after a few seconds. Let the salmon rest for a few minutes before serving. 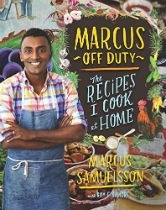 Reprinted by permission from Marcus Off Duty: The Recipes I Cook at Home, by Marcus Samuelsson, Houghton Mifflin Harcourt 2014. Marcus is a chef. He travels to chase flavors.